I ‘forgot’ that I had a little equity income fund which is neither SIPP nor ISA hence I’ve just tagged it at the bottom, so that makes my total portfolio value total £18,078.20. I last tracked my portfolio in April and its value was £15,372.85 – if I don’t include that equity income fund, then that’s a increase in value of £1,508.76. Gains don’t look too clever this month, likely affected by world events. Gains in April were £518.95. 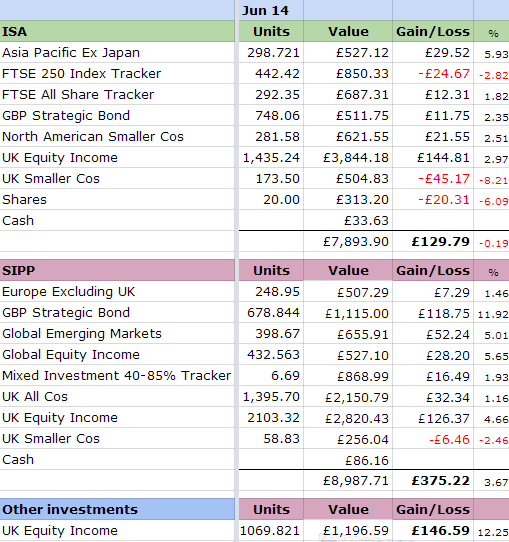 This month, gains (not including the above fund) totalled £505.01, so a decrease of -£13.94. Any income/dividends I get from my funds gets automatically reinvested as accumulated units. When I started my blog back in April, having already missed the first 3 months of the year, I decided to set my goals based on the tax year, ie April 14 – Mar 15 so that I could have 12 months to work with. However, I realise now that I should just make this first year’s goal based on 9 months, ie April 14 – Dec 14, so that all subsequent years will be easier to measure from January to December. One of my goals for 2014, namely the value of my investments portfolio to reach £22,000 was based on 12 months. If I were to base it on 9 months instead, that goal should drop to around £20,000. However, as my portfolio is already at the £18,000 mark, I think I will keep it at £22,000 – it appears that I made my original goal too easy to achieve and this one will make me stretch a little! I’ve mentioned previously that my portfolio consists of mostly actively-managed funds as opposed to the cheaper passive index tracker funds. The split is currently 86.37% / 13.27% – very overloaded towards active funds but this should change as I invest more in trackers and gradually switch some (though not all) of my active funds over to passive. Perhaps initially, I’ll try for 80 / 20 – in fact, I think I’ll make this one of my goals for this year. That fund I’d forgotten I had? I’ll convert it into a tracker asap. I’ve found another investing platform (AJ Bell Youinvest) where I can invest in shares regularly and in certain types of passive funds (exchange traded funds – ETFs) more economically. I’ll see how running with two different platforms goes before I consider trying to consolidate them into the one platform. I’ve received my first repayments (plus interest) from both Ratesetter and Lending Works. The latter have deducted their fee from the first repayment so my total P2P balance now stands at £1998.65 (pre-fee balance was £2007.65). Repayments are being automatically reinvested in the case of Ratesetter. For Lending Works, I’m going to withdraw the repayments (plus interest) and use those funds to lend via Funding Circle – spread my risk a little further! (e) This value includes the £3,166.25 that will be used to pay off my car loan – yes, I know, I didn’t mean to include it in here! Figures will be updated when I have the info. My net worth has increased by £6,524.24 since April. As I’ve stated previously, I don’t know whether this is good or bad – good I guess, as it’s going up! But what is considered a good ‘net worth’ figure? Anyway, my assets (not including property) now total £36,407.71, which is 14.56% of my ultimate goal. Seems such a long way off to go, but I have to remind myself it’s a “marathon, not a sprint” and that I’ve only been tracking for 3 months! This entry was posted in Funds, Net Worth, P2P, Portfolio by weenie. Bookmark the permalink. Wow! You've got a growing positive net worth, that's brilliant. I think you'll definately hit your 22k target because you've got your money working hard for you. Hi DBC, thanks! Yes, my net worth is heading in the right direction! I'm quite positive about hitting the yearly target, assuming that I can maintain my savings rate and that the markets don't go belly up…. I think I read that you are aiming for £250,000 savings in 15 years? but is this on top of anything you put in your stakeholder pension? How does this work and how much do you expect it to grow? Yes, I need to stop focusing on the gains and look at the bigger and more long term picture! And yes, I'm aiming for £250,000 in 15 years and it's on top of my stakeholder pension (not to be mistaken with my work pension), which is very small. If I'm on track, then I should be around the £90k mark in 5 years time. If not, then a serious recalculation will be required! Thanks weenie, it does make perfect sense and, as you say, you can recalculate if needs be. It's being aware and having a plan at all that makes the biggest difference to whether we succeed or not – or that's what I think anyway. Making a plan has certainly had a very positive effect on the way I feel about things. Yes, I totally agree – the awareness and plan makes all the difference, gives us control and yes, success is then of our own making!